Dr. Blake, Director of the Headache Center of Greater Heights, is board-certified in Neurology by the American Board of Psychiatry and Neurology, Inc. and board-certified in Headache Medicine by the United Council for Neurological Subspecialties. She received her medical degree from Georgetown University School of Medicine and completed an internship in internal medicine at Washington Hospital Center in Washington, D.C. Dr. Blake completed a residency in neurology at Georgetown University Hospital and a fellowship in neuro-ophthalmology at the Johns Hopkins Hospital. From 1995 - 2006, Dr. Blake served on the faculty of the Georgetown University Hospital Department of Neurology, where she was director of the Headache Clinic since it’s inception in 1999. In addition to her interest in headaches, Dr. Blake has been actively engaged in research in behavioral neurology and cognitive sciences, and served as volunteer faculty at the Cognitive Neurosciences Section at the National Institutes of Neurological Disorders and Stroke at the National Institute of Health. Dr. Blake is also an Adjunct Associate Professor in the Department of Neurology at The University of Texas Medical School at Houston. She has been featured on ABC-TV’s Good Morning America. Dr. Blake practices at Memorial Hermann Medical Group Headache Center of Greater Heights. 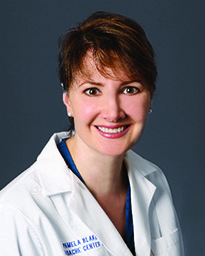 Learn more about Dr. Pamela Blake. Dr. Pamela Blake, director of the Headache Center at Memorial Hermann Northwest Hospital, explains the causes of chronic daily headaches and treatment options including injections and nerve decompression surgery. "In some people, the nerve becomes flattened out and compressed within the muscles, leading to an inflammatory response," Blake said. "This irritation causes pain in the back of the head that may radiate to the forehead or temples. It can hurt just to lay your head on a pillow at night."